Our team of volunteers has completed a Community Orchard as a further extension of natural interest within the Castle Heritage Park. 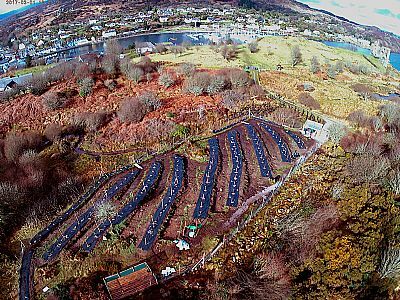 The site has been drained, fenced (to ensure protection from deer and rabbits), and the soil improved with seaweed from the Kintyre shores, biochar, volcanic dust, sand grit, and commercial fertilisers (to balance the pH, to suit the various fruits involved). Some two hundred fruit bearing trees and bushes have been planted on raised mounds in the traditional Scottish way of improving poor land. The site slope faces the south-west, and the planting mound runs are close to a North-South axis to maximise sunshine on both sides of the trees. Fruits planted in various varieties are apple, plum, blackberries, blueberries, gooseberries, blackcurrants and rhubarb. When the various fruits reach the mature cropping stage, we will be organising community fruitpicking days, and distributions will be made to older residents' groups and the school (Tarbert Academy), etc. The project has been funded by Infinis, Awards for All, and NHS Highland (Argyll & Bute Health & Wellbeing Network). We're installing a beehive to pollinate the orchard, and will train volunteers to care for the bees, with funding from the Co-op.